July is the month of swimming, barbecues, and kicking back. Summer is in full swing, and everything has slowed down a bit. 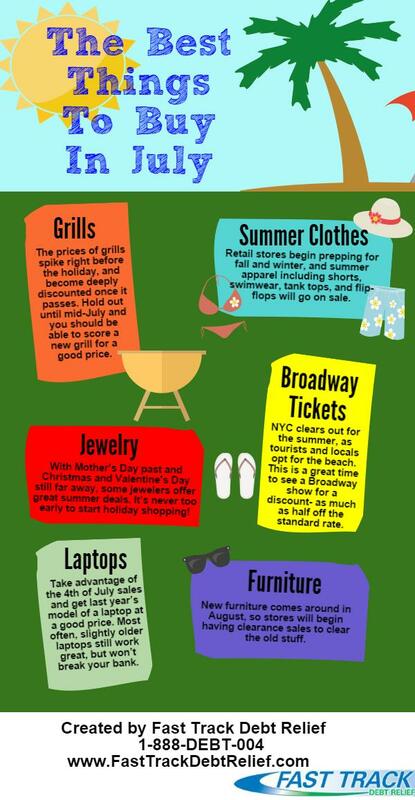 July also happens to be a great month for shopping for deals. With that said, many retailers are offer discounts and deals this month on a variety of items ranging from electronics to tickets to jewelry. July is a good month to purchase several big ticket items. Make sure you're not going to need debt help, but if you’ve had your eye on any of the items listed below, now may be the time to purchase them. The prices of grills spike right before the holiday, and become deeply discounted once it passes. Hold out until mid-July and you should be able to score a new grill for a good price. Retail stores begin prepping for fall and winter, and the summer apparel including shorts, swimwear, tank tops, and flip-flops will go on sale. NYC clears out for the summer, as tourists and locals opt for the beach. This is a great time to see a Broadway show for a discount- as much as half off the standard rate. With Mother's Day past and Christmas and Valentine's Day still far in the future, some jewelers offer great midsummer deals. It’s never too early to start your holiday shopping! New furniture comes around in August, so stores will begin having clearance sales to clear the old stuff. Take advantage of the 4th of July sales and get last year’s model of a laptop at a good price. Most often, slightly older laptops still work great, but won’t break your bank.